I just spoke with another autism mom. She was distraught because the neurologist who performed her son’s MRI had called to say he found evidence of possible/potential seizure activity. She was confused because the neurologist told her to give her son anti-seizure medication, regardless of the side effects and the uncertainty whether seizure activity is even occurring. She was angry because she felt like the neurologist just wanted to get off the phone and had no interest in addressing her questions. Why are doctors pushing so much medication? 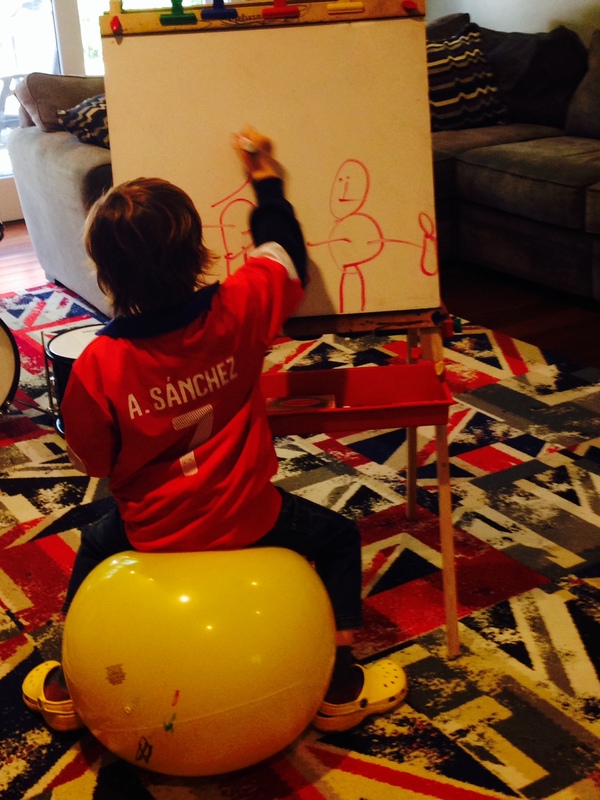 On his latest neurodevelopmental psychological exam, Martin tested strong, academically. Although he has just started first grade, he is functioning at a second-grade level. But, the mainstream doctor who oversaw the exam stressed, when Martin gets to third grade, where the curriculum requires inferential reasoning, he might fall behind; because he can’t attend well, he can’t form inferences, either. We know attention remains a problem for Martin, Adrian and I assured the doctor. What can we do to address it? “Medicate him,” the doctor replied. “Medication might really get him over the hump when it comes to attention,” the doctor said. We’re trying some other approaches right now, I said. We’re excited to be starting treatment with Dr. Zelinsky, using a sensory approach to retraining the brainstem. And Martin’s autism symptoms, including attention, tend to get better in spurts, as his body heals. Maybe by third grade we’ll have attention up to par. Adrian and I told the doctor we would like to hold off and give ourselves time to think about the medication option. Then we thanked the doctor for his time and promised to keep him updated. This particular doctor expressed surprise at Martin’s progress since he was last evaluated, two years ago. I explained what we had done to provoke the progress, including biomed, homotoxicology, and HANDLE therapy. The fact that Martin has come so far using those approaches did not seem to affect, at all, the doctor’s opinion that we should medicate. I am not necessarily against the medication option forever, and I certainly don’t judge parents who decide to medicate their children before trying what I consider more natural treatments. That being said, I am sick of mainstream doctors trying to push medication on us at every turn. Medicate, medicate, medicate. Because sometimes medication is the right choice. And often it isn’t. All this time, you’ve been wondering, What is it? What does Dr. Campbell-McBride say that my blogger doesn’t buy into? Well, it’s time for that post I’ve been working on. I’m vegan. I went vegetarian when I was 16 years old, and vegan just after I turned 22. I did it out of concern for animals and the environment, and I stuck with it for the health benefits. I’m 42 now, so that makes me vegan more than two decades. All in all, I feel . . . fit. I am 5’6”, I fluctuate from 125 to 137 pounds. I exercise. I have strength and endurance levels at least commensurate with my age. The two major illnesses I’ve suffered, measles at age 12 and dysentery at age 21, both occurred before I became vegan (and were unrelated to nutrition, as far as I can tell). I was surprised to discover that Dr. Campbell-McBride, in her book Gut and Psychology Syndrome: Natural Treatment for Autism, ADHD/ADD, Dyslexia, Dyspraxia, Depression and Schizophrenia, writes off veganism as incompatible with long-term health, without explanation. She says that veganism is unhealthy and moves on. I figured that Dr. Campbell-McBride must have more than nothing to back up her opinion of veganism, so I headed for her website and blog. I found a post titled “Feeding Versus Cleansing,” dated 27 March 2012, in which she states, “Purely plant-based diets (vegan diets) are inappropriate for human physiology long-term; they can only be used as a temporary cleansing procedure.” (Disclaimer: I started writing this post in July. I know, I know—it took me a while. Life gets in the way. When I finally got around to publishing my post, I discovered that Dr. Campbell-McBride’s 27 March 2012 post had been removed and replaced with a recycled version, by the same title, dated 15 August 2014. The two posts make the same points; for wording and quotes, I am relying on the 27 March 2012 version. I have it printed out and can post it if anyone is interested in the original.) According to Dr. Campbell-McBride, plant foods cleanse, but by and large, they do not feed/nourish humans. A vegan diet benefits, say, a cancer patient whose body needs cleansing and resetting. Ultimately, the patient, like all humans, must return to eating animal products in order to be fed properly. As I see the issue, Dr. Campbell-McBride makes statements about veganism that sound good in theory but seem unsupportable in evidence. I have read multiple studies concluding, based on evidence, that long-term veganism—lifelong veganism, not a temporary or “cleansing” procedure—when done properly (not, for example, cola and potato chips) makes a person healthier, blocks disease, and adds years to life. The China Study is perhaps the best-known assessment of why veganism works. Dr. Campbell-McBride does not offer any study to counter those empirical conclusions. Indeed, other than one bizarre example asserting that a young woman ate a healthy vegan diet but nonetheless stopped menstruating and wasted away, Dr. Campbell-McBride doesn’t provide even specific examples. She writes assertively about body processes. She doesn’t back her assertions up with evidence. How could it be that a human’s inner body intelligence knows to choose dairy? Milk is indeed a natural food designed by nature over billions of years—designed for a growing calf. That’s right. Cow’s milk has the exact balance of nutrients and proteins that a baby cow needs to grow big. Human milk, what we call breast milk, has the exact balance of nutrients and proteins that a baby human needs to grow big. Cow milk is for baby cows, not grown cows. Human milk is for baby humans, not grown humans. Humans are the only mammals forcing milk into themselves beyond infancy, and to add to this unnatural state they are using the milk of another species. What has that to do with nature? If I were ever to buy into more of the Campbell-McBride theories and start eating animal products (I have no plans to do this), I certainly would not include nature’s baby cow manna. Mother Nature . . . gives us senses of SMELL, TASTE, DESIRE for a particular food and a sense of SATISFACTION after eating it. So, when your body needs a particular mix of nutrients, it will give you a desire for a particular food, which contains just that right mix; this particular food will smell divine to you, and you will feel satisfied after eating it. [B]efore putting anything in your mouth smell it: [I]f it is the right food for you at the moment, it will smell very appealing. If it is not the right food, it will smell repulsive. My body doesn’t seem to be telling me to eat meat. My own health notwithstanding, what about the fact that I bore a child who developed autism? Could my diet have contributed to Martin’s immune deficiencies? I am willing, maybe too willing, to blame myself for my own missteps that I believe contributed to Martin’s autism. I’ve owned many of them, right here in this blog: Allowing Pitocin at Martin’s birth, which snowballed to an epidural and unplanned C-section. Not fighting hard enough when newborn Martin, despite an APGAR of 9/9, was whipped off to the NICU for antibiotics. Vaccinations. Living during pregnancy in a home under renovation. Et cetera. But try as I might, I have been unable to find any credible evidence, clinical or anecdotal, linking maternal veganism to autism. If any reader has evidence of such a link, don’t be afraid to forward it to me. I can take it. In my reading—and I’m no scientist—Dr. Campbell-McBride seems to have a better grasp on restoring a gut than on maintaining a body with a healthy, well-functioning gut. Her mistaken exuberance in carrying her “healing” theories to the “already healthy” realm doesn’t mean I have to assume that the “healing” theories are wrong. The GAPS diet is in line (not exactly, but some similar properties) with other restricted diets, such as the Specific Carbohydrate Diet or the Feingold diet, that help with gut-related auto-immune issues. I can’t find any widespread studies, i.e., real science, so I troll parent groups on-line for other parents’ experience. Most report improvement on these diets. I’m an empiricist. I’m giving the GAPS diet a try with Martin, and it seems to be helping his gut and overall functioning. Several years ago, when we cut gluten, soy, corn, and most starch from Martin’s diet (he already was dairy-free), I consulted a mainstream nutritionist and provided her with a week’s worth of menus. She confirmed that even on a very restricted diet we could meet Martin’s nutritional needs. I have some worry about long-term use of the GAPS diet—ammonia build-up, carnitine’s effects on the arteries, that sort of thing—but Martin will not be on the GAPS diet forever. When his gut is sealed up and in good working order, I will experiment with taking animal products back out of his diet. Already I have him down to one serving of meat per day, excluding broth. In the clinical practice we see the degeneration of the brain function in people on purely vegan diets and other poor diets: first the sense of humour goes, the person becomes ‘black-and-white’ in [his or her] thinking and behaviours, the sharpness of the mind goes, memory suffers, depression sets in and other mental problems follow. These are all the signs of a starving brain. Oh, dear. You know now that I’ve been vegan more than 20 years. Is Dr. Campbell-McBride’s parade of degenerative conditions knocking at my door? Adrian, my husband, does complain that my sense of humor tends toward the “Teutonic.” That, however, is not my diet’s fault. Blame the genes: I actually am German. I’m rarely accused of black-and-white thinking; it’s hard to believe that a black-and-white vegan could support a son on the GAPS diet. As for sharpness of the mind, you readers are inside my head, almost daily at this point. How do things look in there? Dull, or sharp? Memory—meh, it’s not fabulous. But I am in my 40s and, more often than not, sleep-deprived. That brings us to depression and “other mental problems.” Maybe the greatest testament to my brain’s fitness is that—despite having a child with autism, and the daily grind to recover him, and all that we’ve given up to make recovery possible—I am not depressed. I am optimistic and hopeful. Heck, isn’t that a bitty miracle? And if you’re wondering if I have other mental problems, go ahead and ask Adrian. He probably knows me best at this point. No, wait. Do not ask Adrian about my mental problems. I have a feeling that is not a good exercise within any marriage. Just trust me instead. I promise, I’m reasonably sound. The kid eats meat. Me? Not so much. Martin attends first grade now, in a self-contained special-education school for speech- and language-delayed pupils. The school, which is private, meets Martin’s needs in pretty much every way I can imagine. The curriculum is designed by speech pathologists; the student-teacher ratio is small enough that Martin, despite his attention trouble, has never needed a 1:1 aide to keep up; social skills are integrated into lessons, lunch, and recess; and the class comprises academic high-achievers. If you put a gun to my head and told me to make a complaint about the school, I would say this: Martin’s teachers use “food reinforcers.” The first week of the term, we parents received a permission form, asking whether our child could eat popcorn, Goldfish® crackers, Skittles®, or M&M’s® as rewards for behavior and hard work. In Martin’s case, of course, the answer was no, no, no, and no. Instead I sent some go raw brand “chocolate super cookies” for the teachers to give Martin. Popcorn I can’t do anything about. Organic or otherwise, it’s not GAPS-legal. Goldfish crackers? There, I’ve been thinking, I might have a shot. First, I went on-line and ordered a teeny-tiny goldfish-shaped copper cracker cutter. Not kidding. Then, I began searching for a recipe that was, or that I could make, GAPS-legal. This turned out to be much more challenging than procuring a teeny-tiny goldfish-shaped copper cracker cutter. Every GAPS recipe I found included cheese, which Martin cannot have. I struck out also when I Googled Paleo goldfish cracker recipes; by and large, they container butter, or arrowroot powder, or some other ingredient anathema to Martin. I found one recipe ridiculously labeled “gfcf/vegan” when the first ingredient was whole-wheat flour. Combine sifted almond meal, nutritional yeast, and salt. In a separate bowl, whisk together egg, oil, and lemon juice. Combine the two bowls and stir well by hand. Roll out the dough on a stainless-steel cookie sheet lined with parchment paper. (I also dusted the parchment paper with more sifted almond meal, to make it easier to move the crackers once cut.) Cut the dough into shapes. Bake at 350 degrees for 15-20 minutes, or until the crackers are dark and crispy. 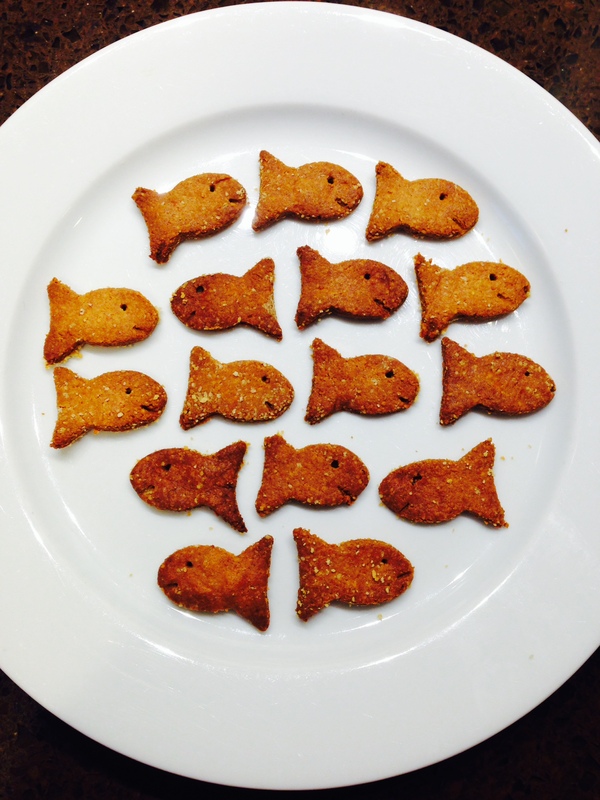 The delighted momma blogger proclaims, “This was a breeze!” I have to guess that her experience was breezy because she did not take the teeny-tiny goldfish-shaped copper cracker cutter route; she rolled out the dough and cut it into squares. My experience involved rolling and re-rolling dough as I pressed the goldfish shape repeatedly, transferred each cracker on the parchment paper, and then used a toothpick to fashion a fisheye and smile. Total time investment? More than two hours for two sheets of goldfish. Worth it? When Martin arrived home from school and saw my second sheetful about the enter the oven, he asked, “What are you doing?” I could see from his face that he knew, full well, what I was doing. I showed him the goldfish that were already baked and offered him one, which he took and ate, as both of us melted with delight. Totally worth it.